Natural Product – Composed of 4lbs of 100% ground freshwater diatomaceous earth with absolutely no additives or fillers. OMRI Listed – Listed with the Organic Minerals Research Institute, a non-profit organization that reviews products against organic standards. Powder Duster Included – Powder duster in the bag for easy and efficient application in difficult to reach areas. Hundreds of Uses – Mother nature’s best kept secret with hundreds of uses. We encourage you to explore the many benefits of food grade diatomaceous earth! Supports a Great Cause – Harris donates 10% of profits to support the local Etowah Valley Humane Society. 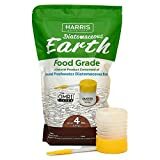 Harris Food Grade Diatomaceous Earth (DE) is composed of 100% ground freshwater DE, with no additives. The product is made of the naturally occuring fossilized remains of diatoms, a type of algae that forms in freshwater. These remains are ground up into a soft, fine white powder that carries many different uses. It’s chemical free and completely safe to use around children and pets. Harris Diatomaceous Earth is listed with the Organic Minerals Research Institute (OMRI) for organic use. It’s sealed tight and packaged in a 10lb bag that can be resealed and easily reopened for ongoing usage. Included in the bag is a powder duster, allowing for easy application of a fine dusting of powder.